New Yorker Electronics now stocks the new Vishay Optoelectronics VLD.1232 Series of Space-Saving Blue and True Green Ultrabright LEDs. 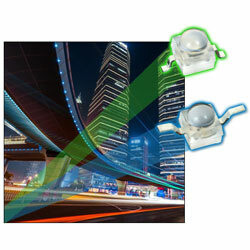 These semiconductors are housed in compact packages with dome lenses and feature the latest InGaN/Sapphire chip technology with a high luminous flux. This series of LEDs also display a narrow emission angle of ± 9-degrees for high luminous intensity, typically to 16000mcd. The dome lens SMD LED series has been created in a small untinted and clear moulded package, with lens, for surface mounting in the gullwing or reverse gullwing version. They have an immediate fit in the markets for traffic signals and signs, smoke detectors, bio sensing, interior and exterior lighting, audio and video equipment backlighting indicators, LCD switches, illuminated advertising and more.